The LSC are proud to offer 3 sets of Queen Stereo cards. Sets 1 and 2 feature Queen in the Freddie days, taken at various times and converted from 35mm film stereos - mainly using a Stereo Realist camera. Images featured in Set 3 were taken during the RADIO GAGA video shoot. 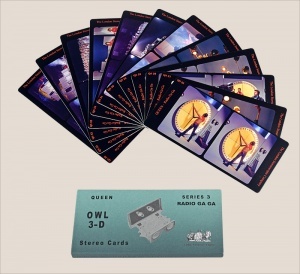 If you purchase any set of 3-D cards at full price, you can then purchase additional cards at £15 per set. The discount will be applied at the CHECKOUT stage.